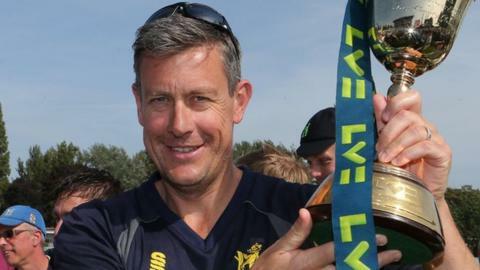 Ambitious Warwickshire coach Ashley Giles admits that, while the England job might appeal to him one day, for now he is committed to the Bears. Following Warwickshire's County Championship win, their second piece of silverware in three years, he told BBC Sport: "I've never hidden my ambition to one day coach internationally. "But I've got a lot of work to do here. We're going in the right direction. "And, of course, England have a very good head coach [in Andy Flower]." Giles added: "One day, if it happens, then great, but I'm a firm believer in keeping your eye on the ball and doing the day job." With his other hat on, as one of England's three selectors, Giles, who took 143 wickets in 54 Test appearances for his country between 1998 and 2006, is in an ideal position to keep his eye on affairs at international level. But it is his success at county level that most concerns him now, as he briefly basks in the glory of Warwickshire's seventh County Championship triumph, ahead of next Saturday's big CB40 final date with Hampshire at Lord's. And he puts the Bears' success down simply to their sense of teamwork under skipper Jim Troughton, Giles' team-mate when they last won the title in 2004. "I just feel very proud for the guys," said Giles. "They're the ones who put their necks on the block every day. "And I'm delighted for Jim Troughton, who has led them really well. All the players would run through a brick wall for him." What made Warwickshire's success in this rain-ravaged this summer all the more impressive was the handicaps they had to overcome along the way. Early season injuries deprived them of both Boyd Rankin and Chris Woakes, who was then called up for England one-day duty later in the season. Warwickshire have now won the County Championship seven times. Before this week, they had also lifted the trophy in 1911, 1951, 1972, 1994, 1995 and under Nick Knight in 2004 (pictured). Jeetan Patel also received a call-up from New Zealand towards the end of the season, while England duo Ian Bell and Jonathan Trott managed just six Championship matches between them. "We miss Bell and Trott for most of the time anyway. That's taken as read," said Giles. "Then Chris Woakes got called up, which was great for him and Jeetan Patel too. And we had Rikki Clarke out injured. "But it was the hard work that the guys put in earlier in the season that got us over the line. "Over the course of the 16 four-day games, the bowlers get tired and there can be difficult times throughout the season when the players must hate me. "But good people added to hard work makes for a very simple equation." Now they have the chance to emulate the feat of Dermot Reeve's double-winning team of 1995, by becoming the first county to claim domestic cricket's 'double' of winning both the Championship outright and the major one-day knockout trophy. "The guys will have some time off before Tuesday's final Championship game against Nottinghamshire at Trent Bridge," added Giles, whose first one-day success as Bears coach was in the CB40 two years ago. "But the focus will then move on during that game towards Saturday and the CB40."